The Eurasia Tunnel, one of Turkey's most visionary mega projects, which will allow automobiles to pass beneath Istanbul's Bosporus Strait, opens Tuesday with the participation of President Recep Tayyip Erdoğan and Prime Minister Binali Yıldırım. Work asphalting the Eurasia Tunnel project in the small Samatya district continues at full speed day and night to prepare the road for the opening tomorrow. A great deal of work has been completed in Çatladıkapı where the tunnel mouths are located. Toll booths were placed at tunnel entrances for the opening ceremony tomorrow. 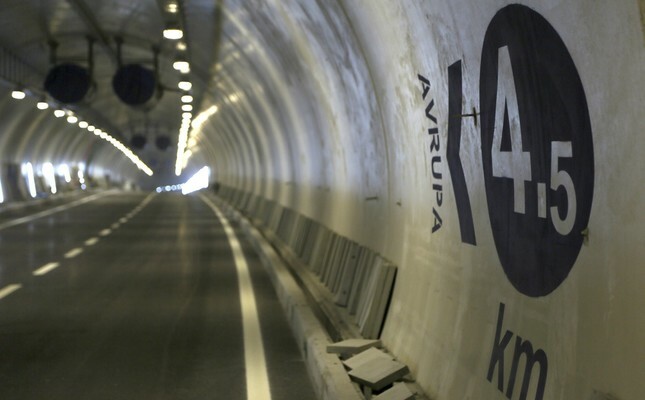 The two-story tunnel, which is 14.5 kilometer long, including a 5.4-kilometer section under the Bosporus, has been constructed for rubber-wheeled vehicles as a sister to the Marmaray, an undersea rail transport tunnel project. It will also reduce travel time from 100 minutes to 15 minutes on a route with heavy traffic. While traffic flow will become smoother thanks to the expansion and regulation of connection roads at the entrance and exit points of the tunnel, the tunnel will also help reduce environmental pollution and noise. As the project will be the shortest route between Kazlıçeşme and Göztepe, it will reduce fuel costs, as well as the amount of harmful gas released into the air and the maintenance costs of vehicles. The Eurasia Tunnel, which started construction in 2011 at a cost of $1.25 billion and is being built 106 meters under the Bosporus, is expected to be used by 100,000 vehicles per day. Instead of the Free Toll Collection System used on the Fatih Sultan Mehmet Bridge, the Eurasia Tunnel features counters between each lane, which is similar to the system on the July 15 Martyrs Bridge. Tolls will be collected via automatic systems and there will be no cash payments to avoid traffic jams. There are no exclusive lanes for Electronic Toll Collection System (OGS) and Fast Toll Collection System users. Drivers can use all lanes regardless of the system they are using. Tolls will be $4 plus VAT for automobiles and $6 plus VAT for minibuses in one direction in the first year.